Do you know what happens to the food from shops that you buy from after the day's over? Those who are part of the voluntary food program decides to give their food for free to the needy ones instead of selling them the next day. You can read more about Food from the Heart program. Visit their website at www.foodheart.org for more info. I happen to have lunch today at a participation restaurant that gives their unsold food away. 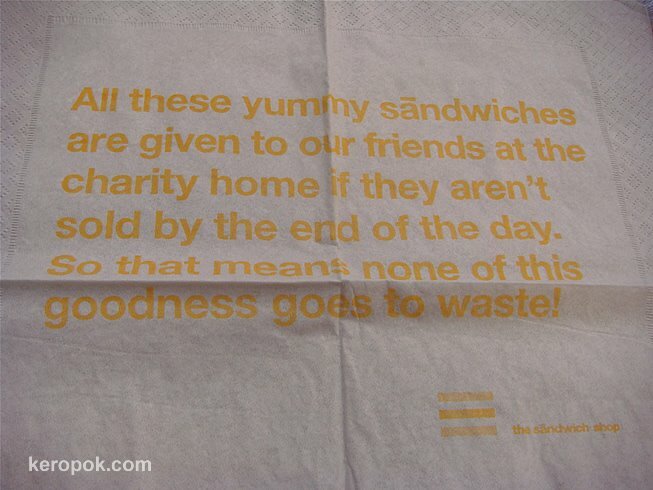 This is printed on their paper serviette. Is there a similar program in the city you live in? I love it that they do that and not waste food. Unfortunately they don't do the same in France. Such a waste. I could help to feed the charities or the homeless people. I've not heard of this before but it seems a good idea. No, we don't see that here. But at some nice restaurants, they have this napkins/serviettes that feels like top quality linen cloth, except they are paper.